Tuesday’s downdraft demolished a key S&P support (see inset), implying sellers aren’t through yet. The rare, exhilarating (for bears) selloff also kicked into high gear two options positions we’d acquired hours ahead of the move — one using call options in VXX; the other, DIA puts. The former doubled in price in under two hours, while the latter tripled from the 0.72 price where subscribers had acquired them earlier in the session. The timing was not mere luck. In the case of the VXX trade — essentially a bet that the steady downtrend that has persisted for than a month would reverse sharply — we used two Hidden Pivot targets to nail the precise low. 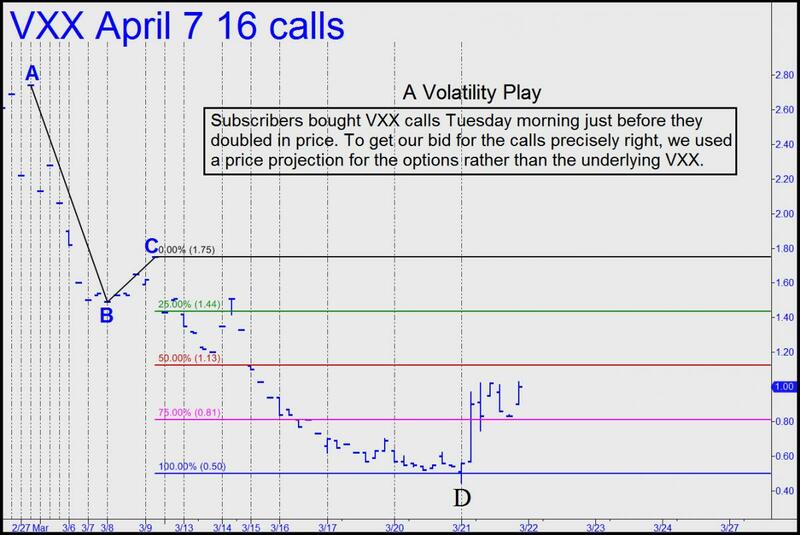 The first was a 15.50 target for the VXX itself; the second, a 0.50 target for April 9 16 calls. They bottomed more or less simultaneously within pennies of where we’d expected, giving us great odds for our option bet. The chart used to target the options is shown in the inset. As for the DIA trade, subscribers had averaged down on puts, buying some for 1.08, and some more for 0.76. As is our custom, Rick’s Picks recommended exiting half of both positions when the price doubled. This has left subscribers who followed my original guidance with positions that cannot lose but which have the potential to produce very substantial gains if the market selloff continues.